Seen on Boulevard Lesia Ukrainka, Kiev, this mosaic seems to have mixed imagery. On the left to lower left, there's Zodiac imagery, though I really can't tell you what the one just below where the man is sitting is. In the center, it's obviously a man, quite possibly a student. Everything off to the right is scientific in nature. 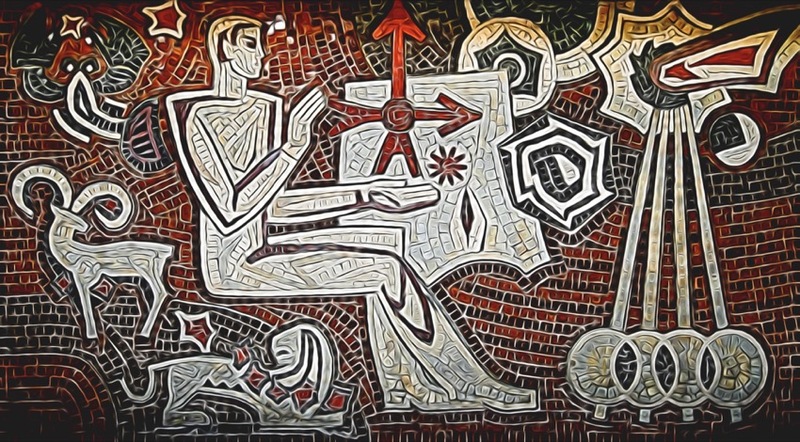 This is one of numerous mosaics on Boulevard Lesia Ukrainka. Processed through Topaz Glow to give it a more abstract look and to give it a bit of a glow.